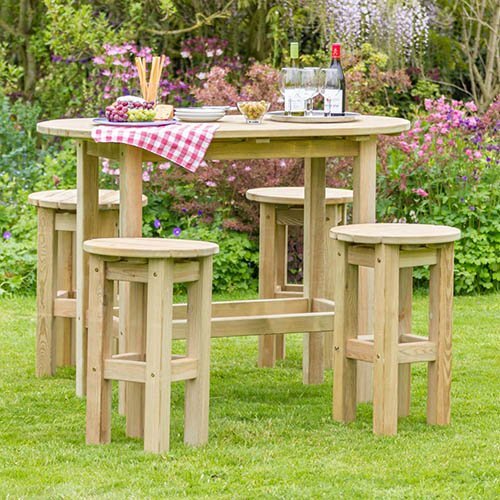 If you're after a larger dining set for your garden, the Bahama Oval Table and Stool Set will be the perfect piece. The table carries a long oval top with four high legged stools, comfortably seating up to 4 people. Additional stools are also available to purchase. The Bahama Oval Table and Stools is manufactured from high quality, pressure treated, FSC® Certified timber to last longer, and comes with 10-year guarantee against rot so you can be sure that this product will last the test of time and remain a beautiful feature in your garden. Dimensions: 1.50m X 0.73m x 1.11m, assembly required - This product is 2-person assembly.